ENROLL NOW for lifetime access! You can take this as a self-paced course. with one-on-one coaching to guide you through the course. And once you enroll, you have access to the community and to the module-by-module group support I offer once a year, each spring, starting in early April. It does this because when we bring our mind and body together we come back to our center, and from that center, we can access our full stories and creative life. Align Your Story helps you break through blocks, set up home practices, and write the work you have been meaning to write. Most importantly, it helps you trust your own voice and write with greater ease, power and courage. Unlike a traditional writing class that focuses on analytical feedback and immediate critique of writing, this course guides you to write so that you become your own best witness and come to trust your own voice. The course also gives you lifetime access to a community of mindful, engaged writers around the world through an active private facebook group. We live in a world of great imbalances, but we all have the ability to come back to our centers and to our own internal balance to create the work we want to see in the world. In Align Your Story, we will look at some of the most interesting imaginings (writings) across time, from Rumi to Tolstoy to Zora Neal Hurston to Thich Nhat Hanh to Rebecca Solnit; we’ll explore what story means and how we access our own story; we’ll get more comfortable with listening deeply and with accessing a full emotional range. We’ll write and we’ll revise and practice new ways of putting it all together. for fiction writers and memoir writers, poets and business writers. It is for professionals, stay at home moms, retirees and anyone interested in self expression and growth. Align Your Story is designed for experienced meditation and yoga practitioners and interested beginners. It meets you where you are. because you have lifetime access. If you want to look at both craft and process, mind and body, then the course is for you. ​and bring your writing to the next level, then the course is for you. or list-style how-to’s and simple fill in the blank blueprints, this course is not for you. Align Your Story is comprised of eight modules. Each module contains a lesson, close readings of great literature, yoga, meditation, writing exercises, a live optional video conference call, and access to a private facebook group. ​and once you enroll, you have access to the material and conference calls for life. In each module I offer a carefully chosen suggested meditation to help clear the static from your mind and come into greater concentration and clarity. And I give you the tools to establish a home practice. Reading assignments and close reading lessons are carefully chosen to compliment the module’s theme and the writing exercise each week. We read writers from Sapho to Rilke, Proust to Maya Angelou, Ann Lamott to Mary Oliver and also influential thinkers like Thich Nhat Hanh, Christianne Northrup and many more. It’s important to bring the body into our creative process because we carry our stories in our body as well as our mind. WRITING EXERCISES & PROMPTS with specific suggestions to work on the first time through the course, and many more exercises to return to over time. I’m Nadia Colburn, and I believe that every person’s voice matters. I’m passionate about helping people share their stories and their unique creativity with the world. I grew up in New York City in a house full of books and have always loved to read. I studied English literature at Harvard and then at Columbia, where I got a PhD. I write mostly poetry and creative nonfiction, often bringing together themes of spirituality, social justice and literature, and my work has won awards and been widely published in places like The New Yorker, American Poetry Review and many other places (please see my writer’s bio and I invite you to explore some of my own writing). As I said, I love reading and writing, but in my thirties, I began to look for something more. I was a mother of two young children. America was fighting a war in Iraq I had protested, and I was becoming increasingly concerned about climate change and environmental destruction. And then I went through a period of intense personal healing and growth. Literature and writing were important to me, but they were not enough to get me through this transition, and the writing world often seemed unhappy and unhealthy. I needed different kinds of answers, and I set off on my own spiritual quest. I began to practice Kundalini yoga and became a serious student of Thich Nhat Hanh. In yoga practice and meditation, I found levels of integration that I hadn’t found in writing alone. But it was still important to me to to honor my inherent creativity, and to use my voice for change. More spiritual communities did not really provide support for those sides of me. For a while, I felt like my writing practice, my love of literature, my meditation and my yoga practices were separate, fragmented in different parts of my life. And then I decided they didn’t need to be. I began to make more and more connections between them. When I did this, amazing synergy began to happen. I felt more alive, more fulfilled, and not only my writing, but also my life had more integration and flow. I knew how to come back to my own center and then write and act from that center. It is from that synergy that I created Align Your Story. “People often talk about how tortuous the writing life is. 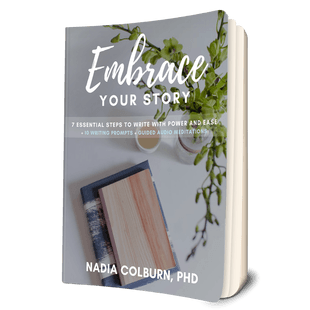 Align Your Story offers a different path, one that incorporates community, physical exercise, meditation, readings, writing prompts, and Nadia’s own gentle, insightful presence and listening. I loved the diversity of resources I found here and how the course (quite literally) strengthens the muscles needed for a regular writing practice. I now incorporate the yoga exercises from this course, as well as meditation exercises, into my daily writing schedule. It puts me in a better mood and reminds me of the rest of myself, the entirety of me, on days that feel frustrating at the computer. “I stumbled upon Align Your Story in a moment of sheer desperation. From day one, Align Your Story is a thoughtful, engaging and inspiring series of modules that takes the writer on a deeply spiritual, soul-filling journey that has the potential to shift your life dramatically. The yoga and meditation exercises were an unexpected bonus and gave consciousness and clarity to each of the writing practices. I had never before written with so much freedom and personal insight as I was compelled to during Nadia’s course. Her genuine interest in bringing out your authentic voice, and gently teasing out the parts of your personal journey that lend weight and meaning to your work keeps you coming back for more each week. “At last I discovered a writing mentor, Nadia Colburn, who dares to value both the craft of writing and one’s personal journey of body, mind, spirit and voice. What I did not expect was how intentionally and lovingly Nadia would hold herself, her students, and the world to that vision throughout Align Your Story. ​Her profoundly powerful lessons, readings, supporting yoga movements, meditations, and guidance in the weekly phone conversations, met me exactly where I was on my own path. Her insight and candor reached directly to parts of my own unconscious. “When I retired , I was determined to move into my most creative self without the constraints and rules of others’ expectations. I just was not quite sure how I was going to get there. To my delight and surprise, Align Your Story came along and lit the way. Align Your Story’s approach to writing as storytelling made me lighter and happier; once I saw myself as a storyteller I also became a story writer. And with that realization came freedom. I was amazed by how the simple act of writing a new ending to an old memory brought me into a different relationship with that memory. What I have found with Align Your Story is a new relationship to myself! Get comfortable with not knowing, with play, experimentation, mistakes, with the ugly, the beautiful, and non judgement. In this module we will write from listening—and then we will practice listening to and reading ourselves. In this module we will try to find a place of stillness and see where that takes our writing. We will read some pieces that encourage us to go deep within ourselves. What we can learn from our shadow side so we can embrace our truest power. Sometimes we need to go into the difficult places before we can really move forward. The good the bad the funny the ugly the beautiful. You can connect with the source of your own power by reconnecting with your power as a child. What have been unexpected moments of joy in your life? When have you had sustained periods of joy? Find your true voice, even if it is deeply sad or hurt or angry; there is joy in the creative act itself. In this module, you will experiment with revising, rewriting, re-seeing. Try on different hats: play, experiment, align. We won’t stress perfection, but will be open, curious, and diligent. LESSON 7 : THE ART OF THE STORY LINE : Learn how to Put it all Together! How do you tell your story? Where do you start? What is significant? What do you put in and what do you keep out? What tone do you take? So how do you keep going? In this final module, you will have the tools to keep your writing practice going for as long as you like–perhaps your whole life. Full of inspiration and encouragement, in this module you’ll fall in love–if you haven’t already–with your own writing. Studied texts: Hafiz, Rumi, etc. Unlike so many writing courses, the primary focus of Align Your Story is not on getting immediate critique and feedback from the teacher or peers, a practice which keeps people stuck in immediate judgement and criticism mode. Instead, this class asks you to go deep inside and to learn to listen to yourself and to become your own best witness within a community of support. ​That said, the premium plan is available for those who want extra support and guidance with setting up a regular practice, with getting through emotional blocks and breaking old habit patterns and with editorial feedback for a truly unique experience. Private Ongoing Facebook Group access with other enrollees for support, guidance and community. Once or twice a year I hold eight 50min live video conferences and with other course members to ask questions and to go more deeply into the work. Audio recordings available to listen to after the conference. Invitation to join these video conferences in all later sessions of Align Your Story, too. ​Contact me for information about payment plans. I want to make this course accessible to everyone who wants to take it. To set personal goals for yourself to reach your fullest potential and breakthrough to the next level. Editorial support to complete a strong draft of a piece of writing (personal essay, chapter of a memoir, collection of four to six poems, short story) within three months of starting Align Your Story, over email, within google docs, and/or in our one-on-one sessions. In this plan, you finish Align Your Story with at a polished draft of a piece of writing. ​and the support of the private premium plan community. Money back guarantee if you’re not satisfied—I believe so much in this course that if you do the work in the first two modules (and show me that you’ve done it) but are not happy with the course, I will give you your money back. WHAT ARE THE BENEFITS OF AN ONLINE COURSE INSTEAD OF AN IN PERSON COURSE? While there are benefits to an in person class, there are also great benefits to on line courses. In this course, you get more material than you would get in almost any class of similar length. You get not only writing instruction, but also meditation and yoga instruction. You can take your time with the course and keep the materials for life, going deeper and deeper into them with time. You can go through the course at your own leisure and on your own time-table. Students benefit from repeating the material in this course many times. Like an in person class, this online course also offers a community of supportive, dedicated writers. This course also offers one-on-one coaching with Nadia. ISN'T THE POINT OF A WRITING CLASS TO GET FEEDBACK ON MY WRITING? There are many points to writing classes. And while one of the benefits of a writing course is that you get feedback from other people, that is only one benefit of a writing course–and sometimes that benefit has its shadow side. In this course you will learn to write without constantly worrying about feedback and judgement. You will be encouraged to really experiment and explore the limits of your writing and understanding and voice. You will unlock your creativity and authenticity. You will become a better reader. You will connect mind, body and spirit. And you will learn to give yourself feedback. ​You will learn to become your own best witness in the safety of a supportive group. That said, I DO value feedback on writing, and sometimes people really want it. That is why I developed the PREMIUM PLAN, which will give you that editorial support even as it guides you to trust your own voice. I'M A PUBLISHED WRITER; IS THIS CLASS FOR ME? Yes! If you want to deepen and align your writing practice, this class is for you. I find that writers are often the people who most need this class–we need to get out of our heads and reconnect and re-integrate our hearts and souls. We need to reconnect with our authentic purpose as a writer–not just for others, but for ourselves. Often the most experienced writers have forgotten that it’s okay to be vulnerable in their writing. But the vulnerability hasn’t gone away–this is a place to explore that vulnerability with grace, compassion, wisdom, and humor. And ultimately to allow that vulnerability to become your greatest strength. I'M JUST A NOVICE WRITER; IS THIS CLASS FOR ME? I believe that even when we are writing about a completely made up bank robbery, some part of us is writing from our childhood self. So take the time to really dive in and explore writing from your childhood. Again, you might surprise yourself by what you write–you might find yourself writing about things you didn’t remember you remembered, or writing in a tone that surprises you utterly. And once you have written explicitly about your childhood, you might be surprised what happens next: some people want to dig in deeper. And they have the tools to do that. And some people are surprised by how much new energy they have to explore other directions and let their imagination free. I DON'T WANT TO DO YOGA OR MEDITATION. MAYBE THIS COURSE ISN'T FOR ME. If you don’t want to do the yoga or meditation, don’t do it. They are optional; it’s all optional. But you might surprise yourself and try–and just see what happens….the yoga and meditation will deepen your writing practice, and your experience of yourself, your body, your mind and the world! You can take this course to help you with a pre-existing project that you are already working on. If that is you, just reach out to me in the first week of the course, and I can guide you through that porcess. That said, even when we are writing about a completely made up bank robbery, some part of us is writing from our childhood self. So take the time to really dive in and explore writing from your childhood. Again, you might surprise yourself by what you write–you might find yourself writing about things you didn’t remember you remembered, or writing in a tone that surprises you utterly. And once you have written explicitly about your childhood, you might be surprised what happens next: some people want to dig in deeper. And they have the tools to do that. And some people are surprised by how much new energy they have to explore other directions and let their imagination free to get to the next level with all of the projects they are working on! I'VE DONE JULIA CAMERON'S ARTISTS WAY AND MORNING PAGES. IS YOUR COURSE SIMILAR? My course is similar in some ways to Julia Cameron’s excellent artist’s way method, and different in others. Much as I admire that wonderful, groundbreaking book and method, my course offers much more than it, and truly integrated mind body and spirit, going more deeply into each of these three areas. And my course unfolds in real time with a community of real people and a live teacher, me! Like Cameron’s work, my course gives you tools and encouragement to tap into and stick with and value your creative self. Like Cameron’s work, my course helps you move through blocks, and like Cameron’s work, my course also has a spiritual dimension. First of all my specific method and insights are different from Cameron’s. You get to have live check ins with me and a community of supportive writers, with whom you can have a life-long connection. And for a limited time, participants also receive a free fifty minute one-on-one session with me. Third, my course is released module by module, so that you can chart your own progress, and really develop a writing practice over time. Fourth, while the Artists Way focuses mainly on writing exercises, my course also develops deep reading skills. ​I believe that good writing comes from good reading. And I also believe that good reading awakens and fuels our creative selves. Included with each module is suggested reading of great published texts and close readings of those texts, that help you understand both content and technique. Fifth, my course also offers a true mind-body-spirit integration and includes yoga and meditation along with the writing exercises and close readings. I'M ALREADY WORKING ON A LONG PROJECT IS THIS COURSE FOR ME? WILL THE COURSE HELP ME CONTINUE TO WORK ON A PROJECT I'VE ALREADY STARTED? Yes! Most people who are working on a long project find this course very helpful. If you want detailed feedback on your project, this course is not for you. But if you want to deepen your relationship to your project, to come at it from some slightly new angles, to get through blocks and to invigorate your writing, then yes, this course is for you. You can work through these modules to fit specific writing projects that you are already working on. If you want some support doing that, feel free to reach out to me for some suggestions about how best to do that. Other students have taken this course as a way to get through a memoir-writing project or other book-length project and have had great success. I THINK OF MYSELF AS PRIMARILY INTERESTED IN YOGA AND MEDITATION BUT NOT IN WRITING. IS THIS COURSE FOR ME? I use the word story to point to any meaning-making system. Stories come in every form: in our bodies, in our emotions, in our dreams. They need not only be narrative. Any time we have an act of creative expression and meaning making, we’re tapping into some story. This course encourages you to go deeply into your art, to let go of a traditional path, and to open up to the creative process. WHAT FORM OF MEDITATION DO YOU USE? I am a serious student of Thich Nhat Hanh, who teaches breathing meditation and meditation in everything we do in our every day lives. I also have a lot of experience with Vipassana meditation and have sat 10 day silent retreats and I’m a certified kundalini yoga teacher. I bring all of these practices toegther and offer a variety of teachings in Align Your Story, pairing individual teachings with the focus of each lession. For example, in our deep listening module, we practice attention to our breath. But in the module in which we are overcoming resistance, I lead students in an uplifting chanting meditation that helps break through old habit energy and blocks and quiets the mind in powerful ways. WHY DO YOU BRING KUNDALINI YOGA INTO THE COURSE? I practice a mixture of hatha, vinyassa and Kundalini yogas personally and bring a mixture of these practices into the course. I focus on kundalini, especially for writing courses, because of Kundalini’s powerful ability to help us break through old energetic blocks and come into greater awareness of the movement and power of our own internal energy systems. HOW LONG DO I NEED TO DEVOTE TO THE COURSE EACH WEEK? I want to step back and tell you a bit about Auden’s own political involvement and the trajectory of his career as a writer. Auden was born in 1907. He was 20 years younger than the high modernists like Eliot and forty years younger than Yeats. He was the first generation of writers to grow up in the wake of the disillusionment and fragmentation of modernist art that came about as a response to the “Great War” the war to end all wars, the war that decimated an entire generation, that introduced the machine gun, trench warfare, tanks and chemical warfare. Whatever illusion of progress that the Victorian period held onto was shattered. And art itself fragmented. Auden started writing at an early age, and was clearly “gifted” to use a word he uses in this poem. His father went off to World War One to serve as a medical officer when Auden was seven or eight. Around the same time, Auden started attending boarding schools. He started writing poetry as a teenager, and his early juvenilia shows the strong influence of Yeats. He was also strongly influenced by Thomas Hardy and others, but Yeats remained one of his strongest influences for many years. Auden attended Oxford, where he was quickly recognized as a rising poet. He sent his first book of poems for publication to T. S. Eliot, who by then was one of the most famous poets, and working in publishing. Eliot turned down the manuscript, but encouraged Auden to keep working on it, which Auden did, and a few years later he submitted it again and Eliot accepted it. Auden’s early work, thus, was written not only under the influence of the high modernists but explicitly for the most famous high modernist poet, T. S. Eliot. Auden’s early work is often oblique and fragmented. They are lyric poems of miscommunication, of desolate landscapes, of secrets and spies and fragmentation. His early poems are brilliant and I find them deeply moving. In fact, when I first read them I fell in love with them. But they circle around themselves and keep coming against dead ends. After his first book of poems—and some dense prose—Auden re-invented himself. He moved away from the legacy of modernism with its fragmented communication. In essay after essay from the early thirties, he talks about wanting to connect with an audience. He starts to write more accessible poems. He becomes the poet spokesperson for his generation, a voice on the left who has a vision of community and fellowship. When the Civil War in Spain broke out, he went to witness the fighting and to aid the leftists through his writing. He wrote about his time there, but left feeling disillusioned. He had seen the ways in which the people fighting Franco turned on one another. He started to wonder about the role of poetry and whether it would be able to fulfill his hopes for it. He was also increasingly uncomfortable in his role as a national poet and figurehead. Partly this was because as a gay man in a country that still outlawed gay love, he did not want to be—nor could he authentically be– a normative figurehead. The secrecy and oblique nature of his early poems in good part is an expression of being gay in a society in which it was illegal to be a gay man, and in which the deepest expressions of love and physicality of gays needed to be clandestine. Even aside from his sexual orientation, Auden was in many ways an anti-authoritarian, and in the thirties in England, the most famous poet was still something of a national celebrity to whom people looked for answers. But Auden was increasingly concerned about the political situation in Europe and did not have easy public answers—much as he always was a poet deeply concerned in the social and moral public world. Auden’s great dismay at the hate and violence that he saw brewing in Europe is expressed in the second and third stanza of this part of the poem. People have become locked and frozen. The “cold dark” days of the first stanza have frozen people from their own compassion so that they cannot even cry. For them, the river of poetry has stopped flowing. But in the next stanza, Auden directly addresses poets—and makes a great claim for what poets and poetry can do. He advises us to go into the dark, and from those dark places to rejoice. To write poetry—to create art—is to transform the soil into vineyards and create lush fruit. The juxtapositions that we looked at in the first stanza are heightened here at the end of the poem: the harshest things: curses, unsuccess, distress, all produce fruit. If on one level “poetry makes nothing happen,” on another level it grows beautiful nourishing intoxicating gardens. ….I believe that the deepest source of our writing comes from our capacity to connect with ourselves and, in so doing, to connect with the world around us and with the sacred. And one key to that connection is through deep listening, which, of course, is the theme for this module. I like to use the verb “to listen” rather than simply “to pay attention” or “look at” for a few reasons. First of all, I think we’re most accustomed to our eyes as our primary sense, and I want to encourage you to tune into different forms of attention. Second, when we look at things, we can only see their surface appearance, and I want to encourage you to go beyond the surface. And third, when we listen we often hear messages. What are the messages that you need to hear and how are they related to your writing? To hear those messages we need to use not only our ears, but also all of our senses–our taste and smell and feeling and sight—and also our inner senses–our inner eyes, our inner knowing, our intuition, our intergenerational wisdom, and our interspecies life force. Writing is most powerful when it becomes a medium that tunes you back into those messages. It’s as if we are radios, and we can tune into many different channels. On most of the channels there is a fair amount of static. At certain frequencies we have very clear reception, and there is no static. The more integrated you are, the more clearly you will hear and the more powerful your writing will be. I’ve seen time and again the amazing transformation that takes place when people listen. When I think of deep listening, two primary teachers come to mind: Thich Nhat Hanh, the Vietnamese Buddhist monk and teacher and peace activist and Christiane Northrup, an innovative doctor, who has revolutionized woman’s health by bringing the whole woman’s experience into healthcare. I think of Thich Nhat Hanh, or Thay, as he is known by his students, as my primary spiritual teacher. His great wisdom and compassion provide me with a model of how to be in the world. Thay was exiled from Vietnam in 1968, after he came to America to advocate for peace. His own life experience—of brutal wars in Vietnam and then the pain of exile—has itself been transformative, and become its own lesson. One of his greatest teachings is of deep listening, in which we patiently listen to one another. Thay teaches us to listen patiently and with compassion and just to be present. When we are present and have compassion, amazing healing can happen. Here he speaks about listening to others, but it’s equally important to listen to ourselves. Indeed, only if we listen to ourselves can we really listen to others. This passage stresses suffering. But it is not only suffering that we hear when we tune in, but also, and perhaps even more importantly, our capacity for great joy and connection. When we stop the static, when we let go of our judgment and our analysis and the ways in which we have been imprinted by negative experiences, we can come back to our joy and vitality—we can let go a bit of the tight hold on the ego and allow whatever is to be, completely, with all the time and space and understanding that it needs. And we can shine. 2) Take one of your pieces and look for things you DON’T say in it—can you go back into the piece and write into the things that you don’t say? Look for where you can add more detail, more feeling, more of your body’s experiences. Make it richer, denser. 3) Take three of your pieces that are related to one other and think about how they fit together. Write a bridge that connects the different pieces. Or write a new piece that brings elements of all three pieces together. 4) Take three of your pieces that seem at first most unrelated to one another. Think about how they may be related. Write a piece or a bridge that connects the different pieces. Or write a new piece that brings elements of all three pieces together. ​and would love to have you in the course and in the community! “For a long time, trying to write felt like poking at a hot bruise of self-doubt and fear. Nadia’s course, which combines yoga, meditation and serious literary work, catalyzed a fundamental change in how I approach my writing, and now, I write with enthusiasm and minimal anxiety. Align Your Story finally allowed me to achieve coherence between my spiritual, physical and creative lives—something I’d been looking for that all of my life without knowing where to find it. “I was in the final stages of putting together a manuscript when I first signed up for Align Your Story, so I wasn’t sure it was the best time to start the course. I was soon to discover, this course is so adaptable to any stage in which you find yourself that there is truly no wrong time to take it. Align Your Story meets you where you are. I don’t think it’s an exaggeration to say that Nadia’s class was life- changing. I had had many hard experiences in a really short period of time in my life, and I hadn’t recognized how those experiences had hardened me and even made me cynical about my own future. I felt like I was stuck and just spinning my wheels. Working with Nadia through Align Your Story has been instrumental in moving beyond that phase in my life. I joined Align Your Story when I was feeling lost about what to do with my life. As I moved through the course, however, I found increasing clarity. Since starting the course, and the writing I’ve done in it, I’ve realized I’ve known all along what I wanted to do with my life—to travel—but without finding my authentic voice, I would not have felt brave or confident enough to go forth…. Writing was essentially the path of my self-discovery; AYS was my guide. It led me to a place where I could sit with myself and just be—no stirring thoughts, no questions, just peaceful contentedness. That was the most precious gift of Align Your Story. Not Sure You Have Time to Commit to Align Your Story? Once you sign up, you have access to the material forever, so there is no falling behind! And though there is a community of support to keep you on track with the work, there are no firm and fast deadlines. so that you develop a life-time, more easeful and more powerful writing practice. and start later, this class is for you! Sign up now, before the price goes up, and give yourself the gift of your own voice and story. Or give the course as a gift to someone you love who is in a transitional moment in her life. Or sign up with a friend and go through the course together; you each get a 15 percent discount!